Don't ask me what that title is supposed to mean. I'm a little bleary-eyed. Was on I-95 at 3:45 a.m. to catch a 6:20 flight out of JFK, which wound up leaving 90 minutes late due to a U.S. Air computer crash at the check-in gate. Got down here, had a quick lunch (Cobb salad from the Marriott, not bad) and headed over to Charlotte Latin Day School for UConn football practice. I haven't caught so much as a wink of sleep thanks to the chatty sisters next to me who didn't stop talking and giggling the entire flight. Still have to write something for tomorrow's Register, so pardon a blog that may not make much sense. UConn arrived on Christmas Eve, all flying in from various hometowns across the country, and everyone made it on time. 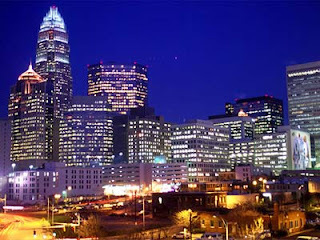 The players have meetings and practices, but the rest of their time is free to explore what Charlotte has to offer. Curfew was 1 a.m. Christmas Eve, and is gradually being cut back an hour each night until game time. They're here to have fun, but they are also here to win a game, Randy Edsall said. Some players visited a children's hospital this morning, and tonight the team is attending the Bobcats-Wizards game, which features a matchup of UConn alums Emeka Okafor of Charlotte and Caron Butler of Washington. At halftime, members of UConn's and Wake Forest's football team will run a three-person relay where each will need to come down, make a shot, and race back. Darius Butler says he's contemplating a windmill dunk in hopes of getting Michael Jordan (a managing partner who attends most of the Bobcats home games) to notice. It was pretty chilly and damp for practice at Charlotte Latin. Weather was in the mid-40s, and the field was slick from last night's rain. Players might be missing the indoor comfort of the Shenkman Center, but considering they could have been in Toronto or Birmingham, there were no complaints. The players receive their NCAA-sanctioned gifts from the Meineke Bowl tonight...they all get Garmin GPS navigation systems. Nice. The highlight for tomorrow morning will be the Richard Petty Driving Experience at Lowe's Motor Speedway. All of the players and coaches will be shotgun as a professional driver takes them for a few laps in a stock car, hitting speeds of around 160 mph. Seems kinda dangerous to me. Jeez. What am I saying? Drive a Subaru Outback wagon with the infant car seat in the back too long, and now I sound like a soccer mom. Everyone seems to be looking forward to the other highlight at Lowe's Speedway tomorrow...the tire changing contest between Edsall and Wake coach Jim Grobe. Seems to be a couple schools of thought on how Edsall will fare on this one. Rob Lunn, for instance, said he assumed Edsall has spent the last few weeks in his garage at home fine-tuning the art of the tire change. But Tyler Lorenzen said Edsall doesn't seem like the tire-changing type. Who was right? "I call Triple-A," Edsall said. He may have an edge, however. Edsall's brother once worked in the pit crew for NASCAR driver Curtis Markham before becoming a college basketball official. Lorenzen is featured in a photo on page 2 of today's Charlotte Observer, taken during the Huskies Christmas Day practice at Charlotte Latin. On closer inspection, it's not Lorenzen. It's receiver Erik Muchette wearing a No. 4 jersey for the scout team. That's all for now. I'll be at Lowe's Motor Speedway tomorrow. Karl Markum? Chip, it was Curtis Markham. We gotta get you to Stafford Motor Speedway some night. At least you didn't say it was Cole Trickle. Wow. That's what I get for blogging on two hours sleep. (And knowing nothing about NASCAR.) Next thing I know, you'll tell me Cole Trickle's inspirational win over Russ Wheeler at Daytona was part a movie and didn't really happen.